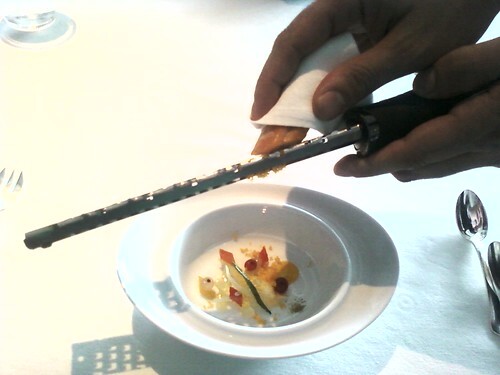 Has anyone experienced Per Se's extended tasting menu? I have a solo reservation in late June and have been given the option of the extended menu... $450 not including wine, but feel it may very well be worth it. I greatly enjoyed my experience at FL in January with the regular 9 courses, but feel I'd be a fool to pass up this opportunity. You can see my report on TFL's extended menu that I did last month in the California thread. 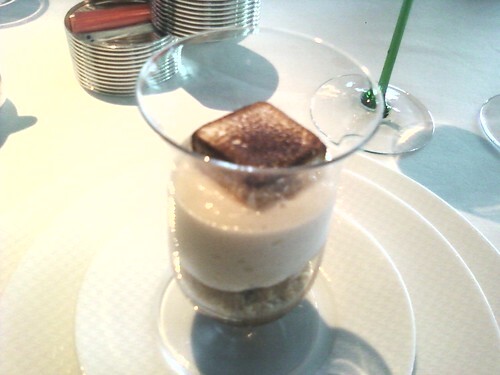 I expect that if you enjoyed the 9 courses at TFL, that you will very much enjoy the extended menu at Per Se. I agree with sickchangeup. I have only had the 'extended menu' at Per Se. It is definitely worth it!!. Just go hungry.. It is a lot of food. I visited Per Se tonight and I had a magnificent meal. I asked about the rumors that Benno, the chef de cuisine, might be leaving soon to start his own restaurant. My waiter told me that the rumor had spread out of hand, and that Benno, while planning to leave eventually, was not in any particular rush to do so under current circumstances. I was assured that his departure was not, therefore, nearly as imminent as has been suggested, and that no time line was anywhere near set. Normally I'd be cynical, but I am inclined to believe my waiter's account, especially given the world's present economic predicament, etc. If nothing else, I am fairly confident that Benno would be around (despite rumors to the contrary) beyond Per Se's two-week June hiatus. WHAT extended menu?? I was never offered that, simply the option of having both courses when there usually is an either/or. I believe anyone can pre-arrange for an extended menu (at an extended price!). The key is pre-arranged, you have to let them know you are interested in something like that when you make your reservation so they have time to prepare. The one time I arranged a special menu at Per Se ahead of time, someone called me back after I made the reservation (a reservation being step 1), and we talked through what I was looking for and agreed on a price (I believe extended menu's start at $450 and go from there). Same for the French Laundry meal. Yikes - talk about diminishing returns. How much more pleasure could someone possibly derive from an extension of the already extended Per Se menu? I'm genuinely curious whether people would think they'd enjoy this. I frankly start stalling a bit at the end of any tasting, much less Per Se's marathon (which I enjoyed, but was definitely long enough). The extended menu is a wonderful expereience. 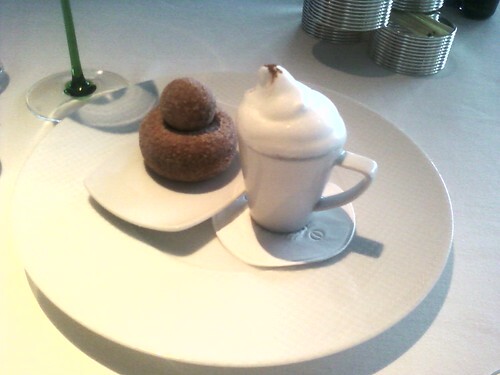 I have actually never had the regular sized tasting menu at Per Se. I have never left Per Se feeling too full; sober, well that is another story. 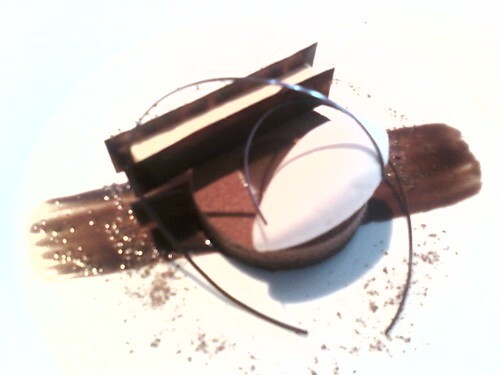 We just had another wonderful visit to Per Se...For myself, I cannot imagine eating another bite past the regular tasting menu. I started fading around the cheese course and needed to wait a bit for desserts. However, I am certain there are those folks who can eat more quantity. Would someone explain more about the extended menu as I am curious? Thanks. My understanding is that the extended tasting menu is maybe 15 courses, as opposed to the usual 9. A number of the courses are smaller, more labor-intensive, and use more luxury ingredients. So it's not as if you're getting twice as much food, but food that is more luxurious and complex. It is certainly something that I would do if I could afford it. i have gotten the 18 course for $275, quite a treat but i was dining along and I ordered nice wine and I had some friends who work there. I have a reservation for per se in july! Im so excited, first time Im going to be in NY too. Yes, should not be a problem as long as you do not intend to use the flash. This is one reason I prefer to go for a late lunch/early dinner - better lighting for the camera. Hmm, I suppose I shouldn't "complain", I did get 14 courses when I was last there--because I requested not making an either/or of the 3 courses but having both. I'll have to see about that extended option next time. I give extra kudos the Sommelier James. He offered instead of doing a glass with each course to do a glass with several course while giving refills. I was able to enjoy them all without getting buzzed. ate in the lounge last night and was very impressed. the food was the equal of my previous meals in the dining room and as always, the wine service was perfect. (roxane is the perfect sommelier) the only complaint is that my seat at a high table was a bit awkward, but the quality of the gougeres, cornet, gazpacho, and my asparagus salad and duck more than made up for the seating. still expensive, but well worth it. I'll circle back later and put all the info here, but for those interested in the real-time account, those are the links. No lottery winnings, just an extremely generous host and an extremely generous kitchen. It's not clear how many courses we had, because there are a few ways to count them. But here's the quick rundown. Some of these photos, all taken with the cell phone and no flash, came out a lot better than others. Sorry for the bad ones, but I imposed a one-photo-per-presentation rule on myself so as not to interrupt the meal too much. We started off with two canapes and a soup. 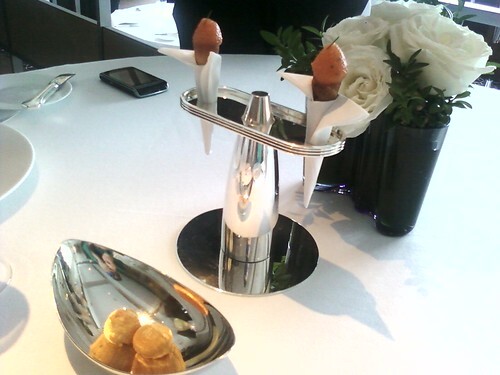 One canape consisted of gougeres and the other the signature salmon cornets. My soup was gazpacho. I should add, my host and I were each presented with a different soup. For almost every course, we each had something different, which when you think about it over this many courses is a pretty remarkable feat considering there were other people eating in the restaurant too. Logistics and good taste prevented me from photographing his dishes, so the photos are only of my own dishes. Anyway, my gazpacho was what I guess you'd call normal gazpacho run through the Per Se system: frothy, creamy, with marinated tomatoes and petite basil. 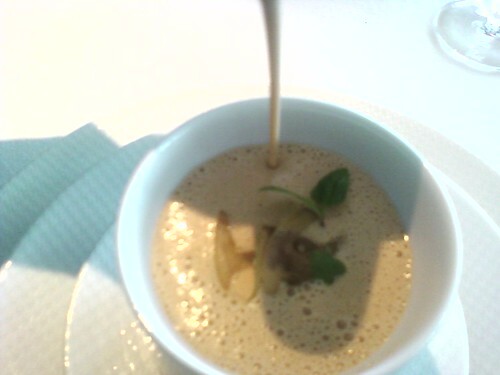 My host's gazpacho was a white gazpacho ("ajo blanco") with Thompson grapes, English cucumber and green almonds. Both were superb. His was better. With those we had Laurent-Perrier 1999 Champagne, transitioning into Txomin Etxaniz, Getaria, Txakoli 2008. Then I had a cucumber sorbet with white Brooks cherries and the best, most concentrated French olive oil I've ever had -- a Nicoise olive oil that tasted like liquefied essence of olives laced with pepper and spice. 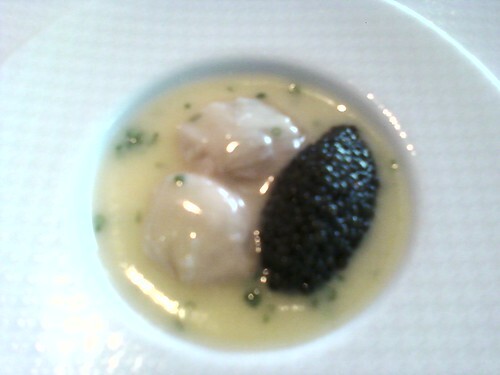 I then had the signature "oysters and pearls" with sterling white sturgeon caviar. 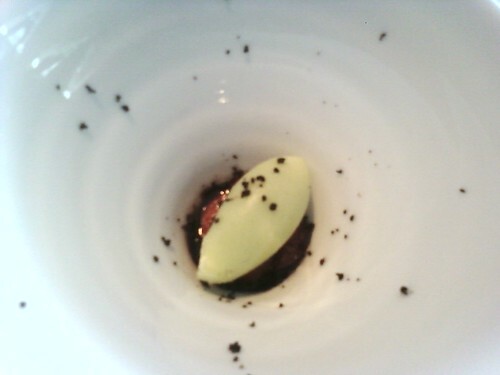 For my host, haas avocado mousse with the same caviar. Mine was better. 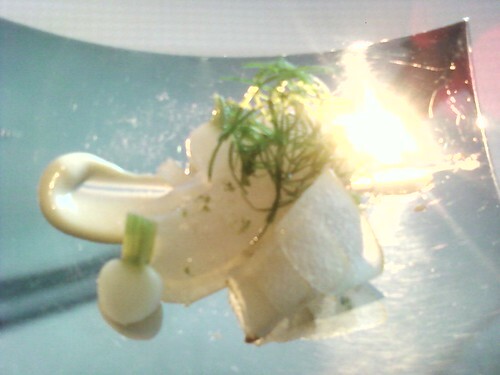 Next, for me, madai belly sashimi with compressed Asian pears, Hakurei turnips and scallion emincee with kanzuri. My host had Hawaiian bigeye tuna sashimi with hearts of peach palm and heirloom radishes and Meyer lemon. I don't know whose was better for sure, but I'm thinking mine was better, which is why I neither tasted his nor offered mine. 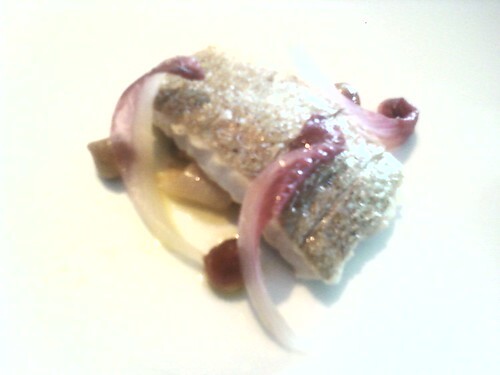 Next I had shaved Greek bottarga over fennel, sweet peppers, tarragon chips and currants with a saffron glaze. For my host, braised red abalone with Koshihikari rice. His was better, and was the best beverage pairing of the day with Blue Apron Ale, brewed for Per Se by Brooklyn Brewery. I then had the signature butter-poached lobster claw (referred to in Per Se terminology as a "mitt") with crispy bone marrow, Oregon cepe mushrooms, watercress and a Bordelaise-like sauce. He had big fin squid with Serrano ham, compressed melon, Picholine olives and compressed basil. The reason all the signatures were coming to me is that I don't eat at Per Se often, whereas my host dines there often enough that he's off the signatures program. However, the signatures were better than the alternate preparations. So, on this course, I won. These were paired with an aged sake, Hanahato, Junmai Kijoshu. Next, two preparations of coddled egg. 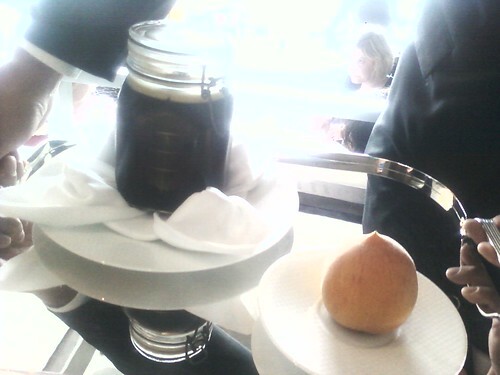 Mine was a coddled egg with brunoise of black truffle (winter truffles that had been preserved). He had a coddled egg with a Bearnaise-like sauce and shaved Italian summer truffles. This course was too close to call. With Radikon 2003 from Friuli. 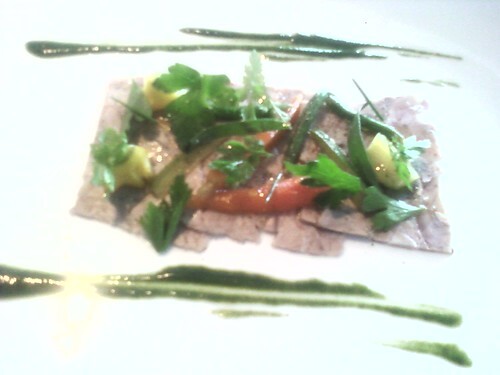 I then got extremely thin slices head cheese with fresh beans and an herb puree. He had Per Se's rendition of pastrami, which I didn't try, again because I was sure enough that mine would be better that I wasn't inclined to share. 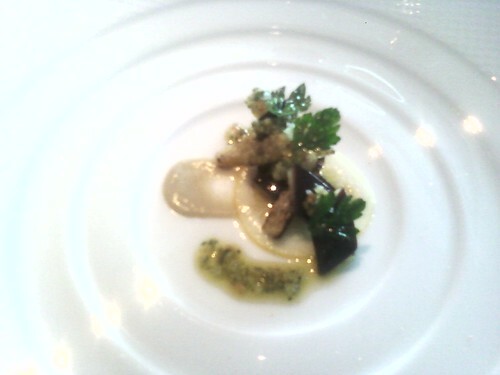 Then I had an eggplant confit, which was gorgeous and I'm sure if you care about vegetables it was a great dish. He had snow peas with carrots and a carrot-ginger gelee. The best vegetarian dish of the day. Now, up until this point, I had been harboring one nagging bit of resentment about the service at this lunch. 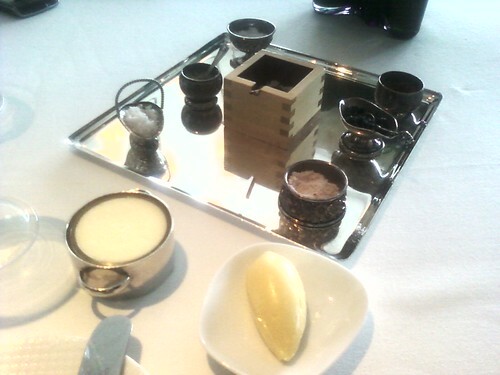 Per Se is one of those restaurants where they wait to bring bread and butter until after the amuse. But an amuse had come and, still, no bread and butter. Then I had a horrible realization: we were still eating amuses. Everything up until this point was just the kitchen warming up. We hadn't really started the meal. They brought the butter, salt and bread arrangements. It wasn't a service glitch. It was attempted murder. So, for the first official course of the actual meal, they brought out quail in a jar. This is a seriously old-school dish: a farce of quail and foie gras cured in quail gelee in a jar. It was then returned to the kitchen and plated up with a peach that could be smelled across the room, some frisee and 100-year-old balsamic vinegar. Yes it was good. I thought for sure that on this one we'd get the same thing, but no, my host did not receive quail in a jar. 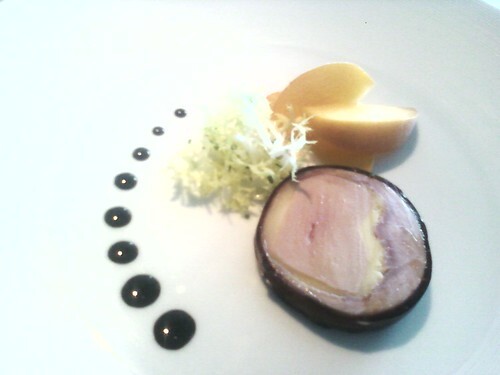 He had a foie gras torchon. Too close to call here on taste, but the quail in the jar had the coolness factor going for it. So I won on this course despite neither dish tasting better than the other. These were served with Domaine des Schistes "Solera" from Roussillon. Then plated up with dates, Belgian endive and red endive, and a bit of Madras curry. We both anticipated that the kingfish would be kind of dense and dry, as kingfish has always been for us. But this was fatty, moist, luscious stuff. Totally redefined my expectations of kingfish. Now we're having lunch. The kingfish was paired with a cocktail, the Per Se dark and stormy, which I think was a better pairing in theory than in practice. Based on the unexpected flavor and great fattiness of the fish, maybe something with absinthe would have been the way to go. 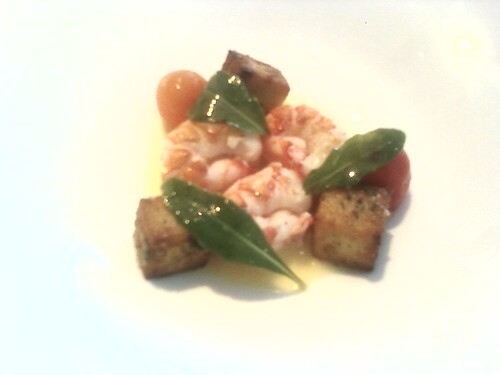 Next I had Scottish langoustines, poached and then finished on the plancha, with tomatoes and an olive oil emulsion. He had a gigantic day-boat scallop with pole beans, purple-top turnips and a French pickle sauce, which was also great, but mine was better. There was one element of his that was better, though: the roe (or whatever that red stuff is) from the scallop had been cooked separately and emerged as a richer, more haunting relative of uni. (This was my host's observation, which I happily incorporate as my own.) Yes we were getting a little full. With Antoniolo "Osso San Grato," Gattinara 1999. A pasta course followed. Mine was buckwheat rigatini with fresh shaved Australian black winter truffles, which packed more punch than I'd have imagined. He had porcini lasagna. Too close to call. Finally some meat. 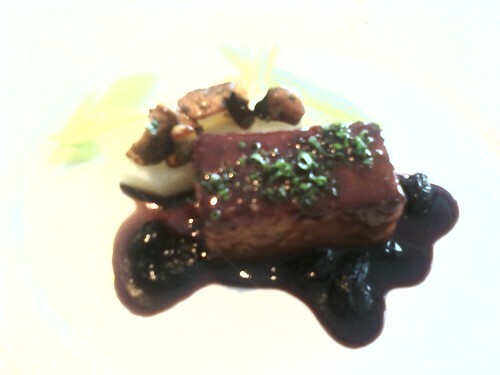 I had pork confit, which I figured had to be the last savory course. He had rabbit presee. Another too-close-to-call course. I was expecting that at this point surely desserts would be immediately forthcoming, however the table settings indicated that there was more meat to come. This was getting a little scary. 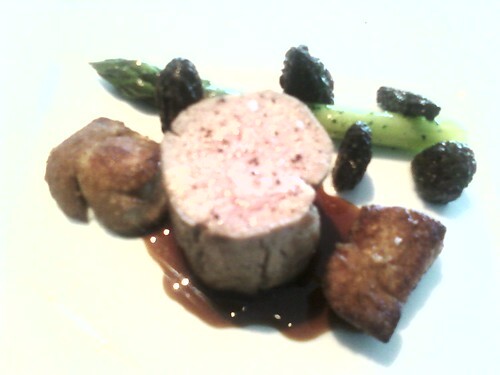 What arrived was, for me, veal tenderloin with morels and asparagus and sweetbreads. It was so great I rose to the occasion. My host had lamb. As an interesting comparison, it was served with lamb sweetbreads. 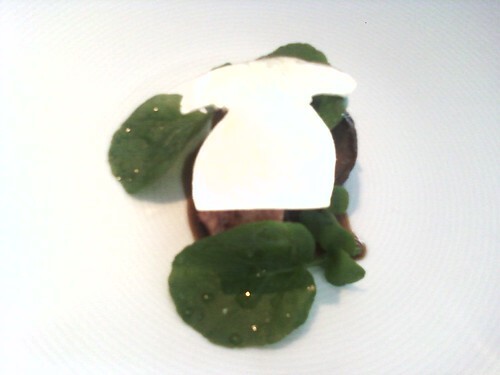 The lamb sweetbreads were far more rustic and assertive than the veal sweetbreads, which were delicate and subtle. Hard to say which was better. The meat courses paired beautifully with Granges des Peres, vin de Pays de l'Herault, Roussilon 2005. I sort of forgot about cheese, but a massive cheese course arrived before dessert. 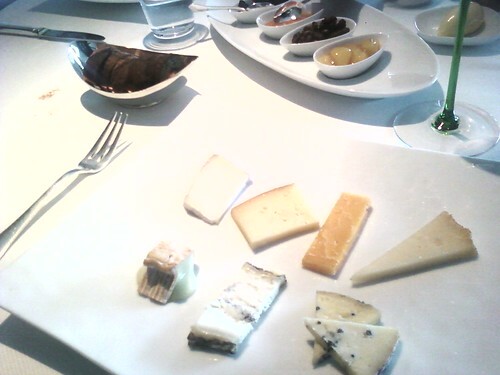 Between us we had 13 cheeses, 7 on each of our plates with one duplicated between the two plates. Also 4 condiments: marinated beets, orange honey, spiced walnuts and mostarda, and a couple of varieties of bread. If I had known at that point that there were six sweet items still to come then I might have run screaming from the building. I had plum sorbet, a fluffernutter float, the "pina colada" dessert, "coffee and doughnuts," "mud pie," and several chocolates. My host had strawberry sorbet, a pineapple float, a hazelnut torte and a "brownie" with chocolate malt. And also chocolates. 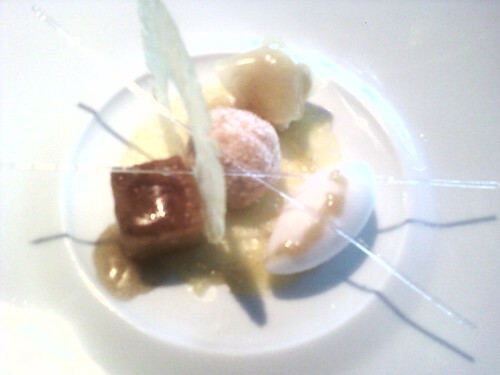 With the dessert courses, first a Riesling from Hexamer, 2007, then a PX Sherry from Perez-Barquero, "La Canda." At the end of the meal, after 5pm, we were granted an audience with the chef, who I imagined would be Jonathan Benno. But when we entered the kitchen Thomas Keller was there, and Jonathan Benno too. I'm not sure which of them worked the lunch service and which was just coming in for the dinner service, or if they were both doing doubles. We all chatted for a bit and then we left with full stomachs and great memories. Needless to say, this was an over-the-top meal. However I can't think of another restaurant in the city with the capacity to produce this level of meal, with the level of service we received. Per Se is truly in its own category. 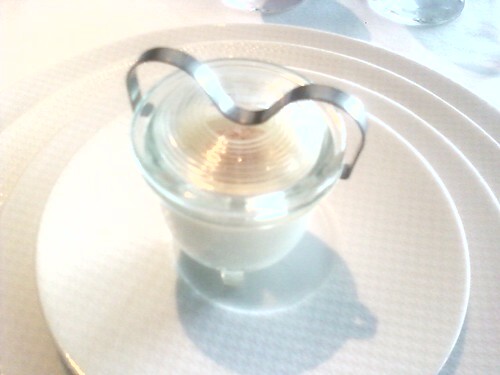 Per Se for me, remains my most favourite meal ever, and that includes Daniel and Alain Ducasse in Paris. I thought I was full after following your tweets throughout the day. After reading your post and seeing all the pics, I am positively stuffed. Heroism can take so many forms. I officially really hate you right now. And I hate all my friends since none of them are adventurous enough to go with me so that we could even have something like this. And myself for knowing I will never have this kind of service and for all the other hate. What a wonderful report along with quite delicious photos. The above dish sounds like it involved some strong competing flavors, namely bottarga, fennel, tarragon and saffron. I'm curious how you felt those flavors both balanced and contrasted one another? And--what did you think of the sweet flavor of the currants in the dish? I'd love to answer the question myself by taking a trek East to dine at Per Se in New York, but that is out of the question. 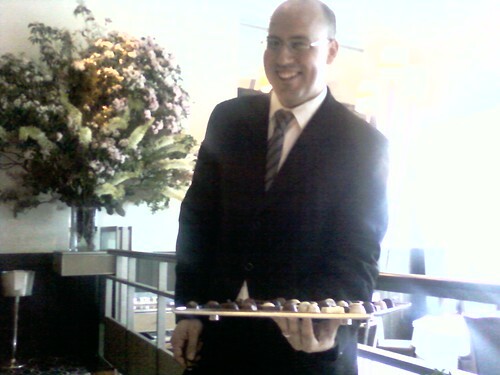 I'll live my Per Se experience through your excellent report. Now if there was a newspaper that was tailored to the life of sickchangeup, the availability of fresh winter Perigord truffles during the summer would have been headline news. Strangely, it was only a couple of days ago that I visited the Momofuku website, checked out their links, found a link to the Tennessee Truffle people who in turn were now selling... Fresh Black Winter Perigord Truffles... from Australia (it's now the start of winter there). They were pricier than what you might find for the ones from France/Italy in the height of winter @ 90/oz. I figured I'd wait to see if I heard anything before thinking about placing an order. Well, I've now heard and tasted. I also grilled the Per Se staff about these. 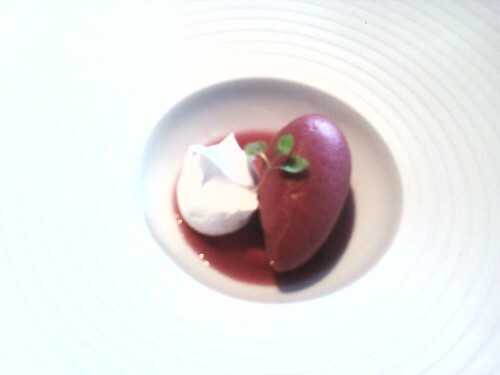 Apparently they just arrived a couple of days ago, and are a first at Per Se (French Laundry had them last year). From what I gathered their impressions are all positive thus far. I was told they had a very authentic and very strong aroma. I believe I also gathered that these are cultivated Perigord black truffles, the eventual culmination of some set of academic work out in Australia (forgive me if I butchered this...). Our servers say they shave very firmly and very cleanly. 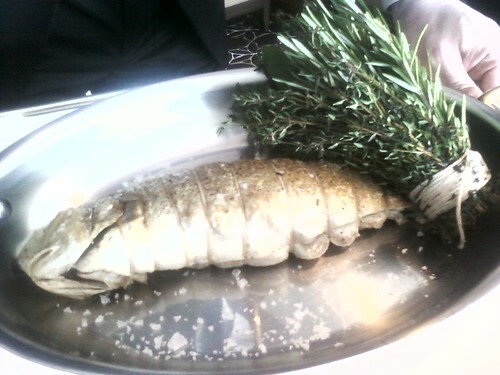 Today they had them shaved over gnocchi with strachetelli cheese for a $75 supplement. The aroma was incredible, I hesitate to say stronger than the French ones (absence does make the heart grow fonder), but it packed a punch. We literally took some time to just sit there and soak it in. 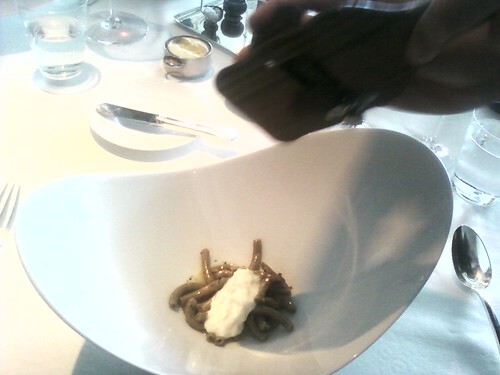 We then proceeded to follow the advice of the staff, and mixed the truffle in with the gnocchi and the cheese. If the aroma felt like an 11 out of 10, then the taste was to my mind milder than their French counterparts. Perhaps it's was a matter of expectations, since the aroma was so strong, I expected the taste to be the same. I'm curious what others think, and am also wondering if we're gonna start to see these pop up around town.